Bangalore: A Supreme Court commissioned study on iron ore mining in Karnataka’s Bellary district has suggested production of the steel-making raw material should be cut by as much as 40% to prevent environmental degradation. The EIA report, a copy of which has been reviewed by Mint, was ordered by the Supreme Court to look beyond the issue of illegal mining and assess the level at which mining can be sustained with minimal damage to the environment. The report argues that this quantity, along with augmented supplies from other districts, would be sufficient to meet the needs of Karnataka, which is pegged by officials at 30 mt. However, questions are already being raised on how this figure has been arrived at. Vishnu Kamath, one of the petitioners in the illegal mining case in the Supreme Court, says: “I feel 25 mt is too high a figure after the environmental degradation seen in the district. We need to understand how this figure has been arrived at." An earlier EIA in 2004 by the National Environment Engineering Research Institute (NEERI) had estimated that iron ore mining would peak at 34 mt in 2030; but that level was breached in 2006-07 because of the explosive growth in iron ore exports to China. 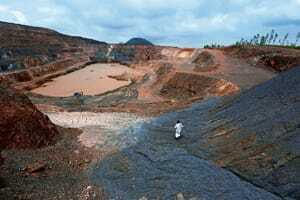 Ore production had quadrupled from nearly 10 mt in 2000-01 to its peak of 41.78 mt in 2007-08. Subsequently, production has dropped in 2010-11 to around 30 mt. Two representatives of the Bellary mining industry declined to comment as they were awaiting the recommendations of the central empowered committee of the Supreme Court on the EIA report. Production was expected to drop as a joint survey team— also appointed by the apex court—had only cleared 24 out of the 99 active mines in the district for continuing mining operations. But the EIA report could pave the way for a permanent cap on the production of ore in the district. ICFRE has recommended the drop in production after its studies in Bellary found extensive damage to the ecology, floral and faunal biodiversity, agriculture, and ambient air. Damage to forest cover has been substantial with nearly 8.9 sq.km of forest area lost between 2000 and 2011. A majority of the mines in Bellary are in forest areas, and many of them have been found by survey teams to have encroached adjacent forests. The study has also found that illegal mining in the form of encroachments for mining or dumping was to the tune of 43 sq.km. Air quality has also deteriorated with the concentration of particulate matter found to have exceeded the national ambient air quality standards. Agriculture also took a substantial hit, with the quantum of uncultivated land seeing a significant increase from 2005-06 in the mining sub-districts of Sandur and Hospet. For instance, in Sandur, only three agricultural plots were left uncultivated in 2001-02; this number rose to 712 in 2005-06 and peaked at 911 in 2008-09 before falling to 641 in 2010-11. The ICFRE report has also favoured larger mines over smaller ones on environmental grounds as larger mines are more conducive to scientific mining. “In Bellary district, severe and significant damage has been caused to the environment by small lease holders, and the damage has been compounded by blatant illegal/unscientific mining operations," the report said. Smaller mines were also found to have extracted higher ore. Data from the mines and geology department show that mines of size less than 5 hectares (ha) were extracting three-and-a-half times more ore per 1 ha than those of size greater than 100 ha. The ICFRE team has recommended that mine sizes should be at least 25 ha and preferably 50 ha, and has advised small mine owners with adjacent leases to bunch up together and conduct operations. On whether Bellary constitutes a single environmental unit when considering mining, the report notes that the district can be divided into three units spread in three taluks: Bellary, Hospet and Sandur. While the high environmental degradation in Bellary is primarily because of non-mining factors, that in Hospet and Sandur is because of large-scale mining operations done in an unscientific manner.